The objective in supplementary feeding programs is to correct deficiencies and/or imbalances in nutrients and minerals in the forage made available to livestock. Due to the seasonality of our rainfall, natural veld or planted pasture goes through periods of ample growth followed by dry spells where not only the availability of forage is scarce, but the nutrient content and digestibility of the forage decreases. The challenge of supplementary feeding is to optimize animal condition and mineral status for maximum conception, calving/lambing percentage, weaning percentage and weaning weight. Animal condition is determined mainly by the availability of forage and the effective supplementation of phosphate in summer and protein in winter. Supplementation involves contributing nutrients to correct deficiencies in nutrient content of natural veld or planted pasture. Substitution is where the natural veld or planted pasture intake is reduced and displaced in favour of the compound/home-mixed feed that is given to livestock. A guideline is that 25-30% of total intake, or an amount not exceeding 1% of body weight, should be supplemented, otherwise substitution of the natural veld or planted pasture takes place (see Production Licks). The Prolick series of products incorporates a mixture of starches and sugars as part of their base ingredients. This supplies rapidly fermentable carbohydrates to the rumen microbes. This alone is not sufficient to ensure high fibre digestibility and intake of forage. The incorporation of NPN (non-protein nitrogen) or natural protein in most licks contributes vital nitrogen to the microbes and acts as a rumen stimulant. The use of ionophores (monensin, lasalocid) in some products also improves fermentation in the rumen and aids in the prevention of acidosis. The ionophore inhibits the lactic acid producing bacteria, without influencing the lactic acid utilizing bacteria, thus helping to control the reduction in rumen pH associated with a build-up of lactic acid from rapid fermentation of grain starch. South African soils and natural veld are extremely phosphorus deficient. Phosphorus supplementation has a large impact on cow/ewe weight, reproduction and calf/lamb performance. The best time to supplement phosphorus is on green summer veld or planted pasture when animals are in a positive mass balance (gaining weight). The better the quality of grazing and thus the potential for production, the better the effect of phosphorus supplementation and the efficiency of phosphorus utilization. Conversely, supplementing phosphorus at high levels during the winter (when dead or dormant forage is available) could induce weight loss in livestock and should thus be limited. The aim with phosphorus supplementation is to achieve intakes of 12 grams of P/cow/day and 1.5 grams of P/sheep/day during the growing season, and to limit phosphorus supplementation to 4gP/cow/day during the dormant season. Calcium supplementation goes hand in hand with phosphorus supplementation. Excessive supplementation of calcium acts as an antagonist to most of those trace minerals that positively influence fertility and general animal health. For that reason, supplementation of calcium in the Prolick range (except feedlot products) is limited to ensure a ratio of 2 – 3:1 of calcium to phosphorus, to ensure optimal growth and fertility. Due to this, some of our products (clearly indicated with an *) do not comply with the minimum mineral requirements for a mineral lick according to Act 36 of 1947 at minimum intake levels. Likewise, sulphur acts as an antagonist to trace minerals and the nitrogen to sulphur ratio has therefore also been limited to a ratio of between 10:1 and 14:1, which is in the range that ensures effective microbial protein synthesis in the rumen. The primary nutrient shortage in dry winter forage is protein. When the protein content of dry winter forage declines below 7% (dry matter basis) the digestibility of the forage decreases which can lead to lower intakes. This results in reproductive animals losing weight and calving/lambing in poor condition with consequently lower milk production and low weaning weights. Protein supplementation in the form of non-protein nitrogen (NPN) has proved to prevent or reduce the loss of weight in livestock over the dry season. The supplementation of NPN (mainly urea) increases the digestibility of the low quality roughage and increases intake to prevent weight loss. Protein supplements are often called Maintenance licks. 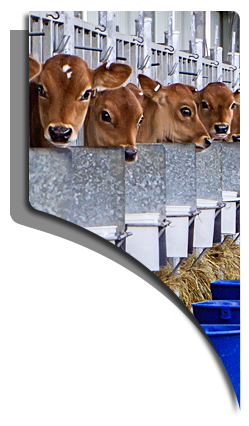 The aim with maintanance licks is to supplement 150 to 220 grams of crude protein/cow/day. The prevention of weight loss in the dry season (±180 days) leads to reproductive livestock calving or lambing in better condition with heavier weaning weights and better re-conception rates. The objective of protein supplementation is therefore to prevent weight loss, but also to supplement trace minerals and Vitamin A in order to maximize re-conception in the following mating season. Various methods are used to gauge when to start feeding protein: 1. Ammonia nitrogen in rumen fluid is less than 8mg/100ml; 2. Blood urea nitrogen falls below 8mg/dl; 3. Condition of livestock. When body condition is used as the criterion, mistakes can be made due to weight loss having already occurred by the time you notice (up to 20 kg loss in beef animals) a drop in condition score. This is where TRANSITION LICKS have their application. A 3% phosphate lick (50kg Summerphos P9 + 100kg salt) can be fed for the last two weeks of the growing season before feeding maintenance licks. Ensure that intakes are at least 200 grams/animal/day of this “transition” lick, before changing to a maintenance lick. Lekkonsentraat into a Maintenance Lick. The ideal is always to have enough winter forage available till the end of the dry season where maintenance licks can be fed until green forage is available. If available forage runs low by the end of the dry season, maintenance lick supplementation will be insufficient to prevent weight loss and Production Licks will be required. Production Licks partially substitute forage by supplementation of energy by means of grains and their by-products (wheat bran, hominy chop). Production licks can also be used to prevent weight loss during the first two months of lactation in order to increase conception rates in the following breeding season. Fattening/maintenance of cattle and sheep on crop residues such as maize stover / sorghum stover / wheat stubble, plus grain kernels spilt during harvesting, and the post-harvest residues of soya beans, beans and legume crops, should be encouraged. Maize residue is often available in abundance, but an understanding of its nutritional value and proper supplementation is essential for economic use thereof, either for fattening or maintaining the breeding herd. Sheep fatten more successfully on maize crop residues than cattle, because they can pick up wasted kernels. During the first two or three weeks on maize crop residues, their diet consists almost exclusively of kernels, even to the extent that acidosis may result. Buffer Lick has been specifically designed to alleviate the negative effects of acidosis through the use of buffering and rumen stimulating agents. Grazing of standing crops (un-harvested or partially harvested, dried out) is gaining popularity and the same principles apply as in the use of post-harvest crop residues. Grasslotting entails the growth and fattening of cattle and sheep to their maximum potential on green summer veld/pasture with minimum inputs. Beef farmers retain their weaners in April/May (summer rainfall area) and maintain them on a Maintanace Lick (Meadow Winterbreker Readymix) for the months of April to September. At the beginning of October “long weaners” weigh approximately 240kg and are implanted with a growth stimulant and supplemented with a Production Lick (Meadow Beefbooster 18) to maximize growth on early, green summer veld (summer rainfall area) or pasture (all areas). It is of great importance that livestock be fed supplements at least every second day and that there is sufficient trough space to ensure even intakes across the whole herd. It is of utmost importance that the total mineral status of the livestock operation is adhered to when the supplementary program for a full year is planned. The macro minerals are calcium (Ca), phosphorus (P – the most important), sodium (Na), chlorine (Cl), magnesium (Mg), potassium (K), and sulphur (S). Salt is used as an intake regulator and therefore sodium and chlorine are adequately supplemented. Phosphate supplements and protein supplements all contain phosphorus, calcium, magnesium, potassium and sulphur at different levels. Six essential trace elements are added to all the licks, namely copper (Cu), cobalt (Co), zinc (Zn), manganese (Mn), iodine (I) and selenium (Se)(of which at least 25% is in an organic form). Iron (Fe) is omitted, as there is sufficient of this trace mineral in drinking water and forage in South Africa. With phosphate supplementation during the growing season and protein supplementation during the dormant season, calving/lambing percentages can often be increased to 80/100%. It is only when an efficient mineral/trace element supplementary program is added to the phosphate/protein program that calving/lambing percentages can be increased to above 90/120%. VOLUNTARY INTAKE OF LICKS It must be noted that lick intakes are variable. In years with good dry season grazing (even rainfall throughout the rainy season) voluntary intake of licks can be lower than expected. This should be seen as a positive effect, which will result in a saving to the farmer. Ruminants have the ability to regulate their intake of Maintenance Licks according to forage quality. Ensure that forage is always available ad libitum. If forage availability is insufficient, excessive Winter Lick intake results, which can lead to urea poisoning. The nutritive value of sweetveld and sourveld varies extensively and supplementation programs of energy, protein and minerals should be based on fluctuations in specific locations. Grass and/or pasture species differ in quality and amount of dry matter yield which will determine which supplementary feed is required. The production status of the livestock will also determine which products to use, whether fattening on the veld / pasture or maintaining the breeding herd. Consult your Meadow Technical Advisor for judicious use and planning of a supplementary program and customized supplementary products. The synthesis of microbial protein in the rumen from urea is assisted by rapidly fermentable carbohydrates (starches and sugars) which degrade at about the same rate as urea. This not only lowers the pH of the rumen and the activity of urease, thus slowing down the production of ammonia, but also activates and increases the rumen microbial population. Urea intake should be gradual and over a long period to increase its efficiency of utilization and decrease the risk of poisoning. Twelve to 14 grams of urea intake at once would be fatal to a 50kg sheep. However, intake of 55 grams of urea over a whole day have shown no negative effects. The safety margin for cattle is 120 grams of urea. The presence of natural protein in the licks improves the utilization of urea. Urea is water-soluble. Licks that become saturated with water causes urea to dissolve. Livestock that drink this solution can be poisoned. Ensure that licks are protected from rain. Given the above factors, the risk of urea poisoning is still omnipresent and care should be taken to use licks as prescribed. Limit the intakes of licks to that which is expected. Make sure adequate forage is available at all times and that licks are protected from becoming wet, and the troughs have sufficient drainage. Take note of the transition lick strategy to prevent salt hunger and excessive Winter Lick intake. Do not feed lick concentrates as such (without mixing), but adhere to proper mixing ratios as per instruction on the bag labels. The most common cause of urea poisoning of ruminant livestock is when urea-containing concentrates are fed without mixing. All concentrate bags in the Prolick range are marked as such by a distinct black band running the length of the bag, on both sides. Farm workers should be trained to recognize such bags as concentrates. The bag colours also differ between products. Protect these feeds against rain. NPN is soluble and animals drinking such a solution can be poisoned. Do not feed these feeds indiscriminately with other feed containing NPN. Consult an Animal Scientist. Mix concentrates thoroughly with the prescribed ingredients. This is a supplement and not a feed. Sufficient grazing and/or roughage must be available at all times. Ensure that feed troughs are always full and give animals free access to grazing. A salt-phosphate lick must be fed for a minimum of seven days prior to feeding any animal a NPN containing lick. All chemical fractions referred to in this guide are on an “as is” basis and not on a dry matter basis. All reference to Energy values (ME Ruminants) is based on estimated Energy values. All products in this range is registered according to the prescriptions of Act 36 of 1947, and/or approved deviasions from those prescriptions. Our product range is constantly being revised, improved and new products are added to the range as and when required. The registration of new, and ammendments to old products, can take several months. Due to these facts it may happen that the composition of products may differ slightly from what is indicated in this guide, at the time of print. If there is any doubt regarding the registered content of a product, please contact your local Meadow Technical advisor, or the Product manager, for the latest updated information.